""A single consumer product holds our nation hostage: the handgun,"" notes Sugarmann bluntly at the opening of this book-length editorial in favor of banning handguns in the United States. The author, executive director of the antigun Violence Policy Center, debunks myths about handgun control and makes the strong argument that limited moves toward handgun control, such as licensing and registering, won't stem the tide of violence. 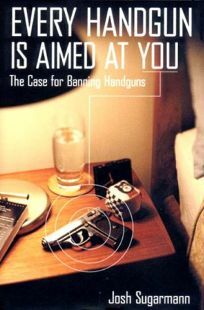 The book begins with a brief historical survey that argues (interestingly supporting Michael Bellesiles's argument in Arming America) that handguns did not become widespread in the U.S. until the Civil War, when the introduction of the Colt pistol and westward expansion fueled gun sales and deaths. But most of the book's focus is on present-day issues such as crime and self-defense. Sugarmann emphasizes, for instance, the correlation between the availability of guns and suicide rates. Sugarmann criticizes gun manufacturers and distributors for marketing campaigns that target not only women on the benefits of gun ownership for self-defense (a statistically unfounded argument, he claims) but also minorities (with bluntly racist overtones)--both groups have lower handgun ownership rates than white males. This muckraking book should be required reading for those who want to be better informed--whether they are for or against gun control--though in fact it will probably sell only to antigun advocates. (Mar. 30) Forecast: Both stronger in its antigun position than Philip Cook and Jens Ludwig's Gun Violence (Forecasts, Oct. 30, 2000) and more accessible to the general reader, this book, with its provocative title, could achieve impressive sales.